Who Killed Kathleen Gingers?, by Gary Akins – book review by Fred Patten. Who Killed Kathleen Gingers?, by Gary Akins. Revised edition. Illustrated. Austin, TX, Furry Logic Productions, February 2010, trade paperback $15.00 (136 pages). For those who object to funny-animal fiction – stories in which there is no reason for the characters to be anthropomorphic animals instead of regular humans – Who Killed Kathleen Gingers? can be easily skipped. For those who don’t mind it as long as the story is well-written, and who like crime noir murder mysteries in the Sam Spade/Philip Marlowe/Shell Scott/Travis McGee tradition, don’t miss Who Killed Kathleen Gingers? Calico Rock sheriff’s office detective Allan Connell (ferret) is sent to investigate the reported murder of vivacious Hollywood star Kathleen Gingers (mouse) at her palatial Pacific Beach vacation home. When Gingers herself answers the door, it looks like the report was a prank – until Connell and Gingers find a real body, that of Gingers’ murdered private secretary, who looks very much like her. There’s a second murder before everything is wrapped up. This isn’t entirely a funny-animal novel. Connell’s being a ferret (unusually elastic) comes in handy, and he’s addressed sarcastically as Mr. Ferret and Detective Stretch-rat a couple of times. Other characters include a beaver, a cat, a fox, a raccoon, a skunk, a squirrel, and a wallaby. Their fur and tails are mentioned. Furry Logic Productions does exist, but it only publishes the books of its owner, Gary Akins, and – unless you know to mail-order them from him – they’re only available at his dealer’s table at the annual Mephit FurMeet convention in Memphis, Tennessee. Akins explained that he originally wrote Who Killed Kathleen Gingers? for serialization in the fanzine FurryPhile, starting with #5 in September 1995. FurryPhile was discontinued after #10 in January 1998 with his serial still in progress. Akers didn’t want to leave his story unfinished, so he completed it and published it as a booklet from SilverFox Publications in 1999. He later met Mike “Keefur” Preston, who runs a print shop, Paw Pad Printing, in Memphis, Tennessee, at the Mephit FurMeet convention. Keefur prints the MFM’s annual program book. Keefur persuaded Akins to have all his out-of-print fan-fiction republished in 5.5” x 8.5” trade paperback format. 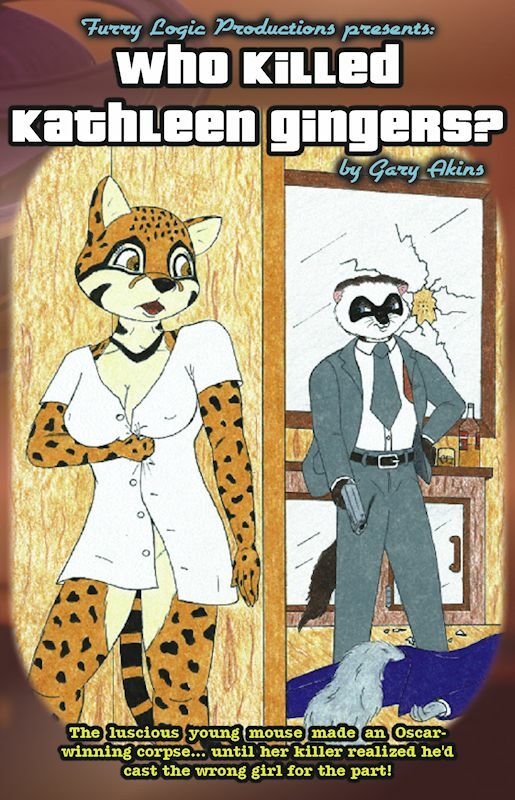 Akins has done so as his own Furry Logic Productions, first reprinting Who Killed Kathleen Gingers?, then publishing this 2010 expansion of the story with illustrations (one in full color) by seven furry-fan artists, including the cover by Jeff Pierce. Furry Logic Productions currently consists of five books by Akins, including two more Allan Connell mysteries; The Widow Who Didn’t Weep and A Prophet Without Honor. He is considering publishing furry fiction by other authors, including the out-of-print “Fornax” series by Matt J. McCullar, about the misadventures of the quintuplet ratel (honey badger) Fornax sisters (named for colors; Pink, Blue, Yellow, Green, and Violet) trying to become a singing quintet in the sleazy pop-music industry.